SPRINGFIELD – State Senator Martin Sandoval (D-Chicago) reacted to the State of the State address by bringing attention to the state’s appallingly high unemployment rate. One year ago, Illinois had a 10.1 percent unemployment rate and today it is 8.6 percent. However, Sandoval states this number is still too high. The national average is 6.5 percent and the state of Illinois needs to focus on investing in jobs to get people back to work. 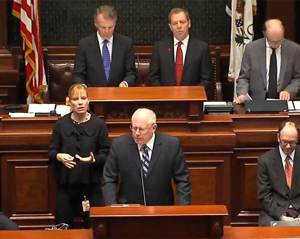 The Senator is co-sponsoring Senate Bill 68 with Senator Kim Lightford to convert Illinois’ minimum wage into a living wage of $10 an hour by 2016. Sandoval believes that people who are working a 40-hour workweek should be able to provide food, shelter and child care for their family and $8.25 an hour simply isn’t enough. Sandoval also argues the state’s economic development policy needs to get back to the basics of training Illinois residents to fill jobs rather than sending large tax breaks to a few large companies. “I agree with Speaker Madigan that we need to stop giving special tax breaks to corporations who continue to look to the General Assembly for handouts. Instead, we need to focus on the mom and pop small businesses that are the backbone of the Illinois economy,” said Sandoval. “The people of Illinois deserve action. Hoy! No manana!” said Sandoval. 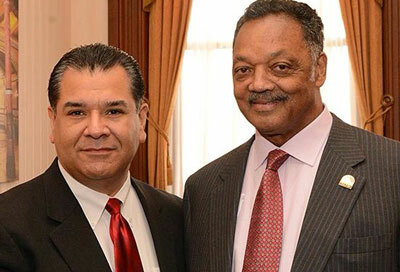 State Senator Martin Sandoval recently met with Reverend Jesse Jackson on the eve of Martin Luther King’s Day to honor the civil rights leader. Both agreed there is civil rights work left undone from Dr. King’s dream, such as immigration reform. The Rev. Jesse Jackson has openly criticized the immigration law as "disgraceful and unnecessary,"
Rev. Jackson also has voiced his support for the DREAM Act.